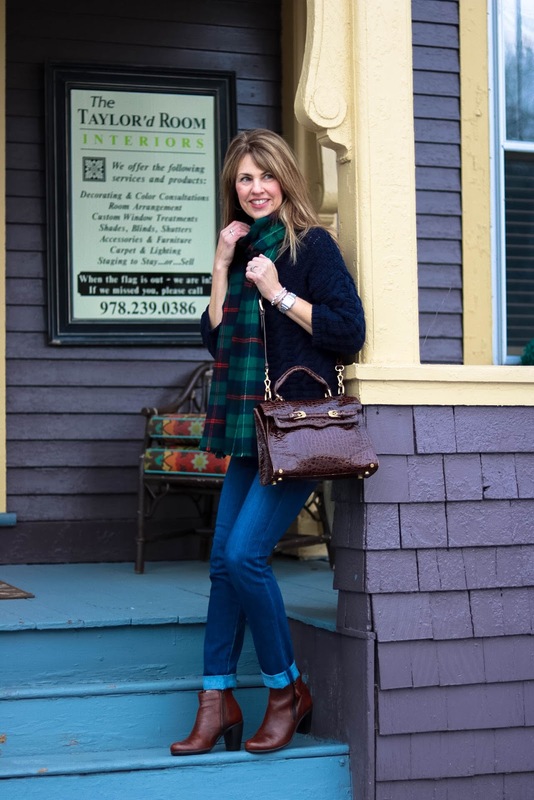 Strolling down the streets of Andover, MA (my hometown!). Andover is one of those rare towns with a beautiful center, chock full of fun stores and restaurants. 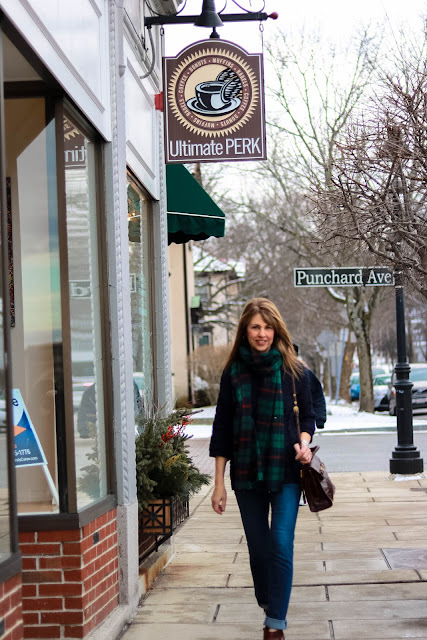 I LOVE the coffee at Ultimate Perk--self-professed caffeine addict here. It's been pretty darn cold in the Boston area, but this chunky navy sweater is cozy and warm. It's actually warm enough to go "coatless", especially when bundled with a thick scarf. Similar sweater styles HERE, HERE and HERE (LOVE the fair isle design on this one!). 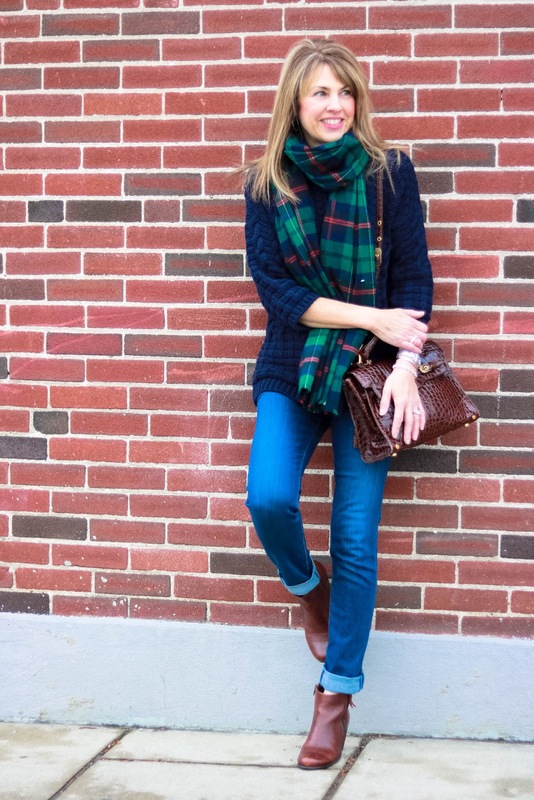 This plaid Snug scarf is from Andover's Helen Thomas (they ship!). I love the length---I have this thing about scarves being too short! 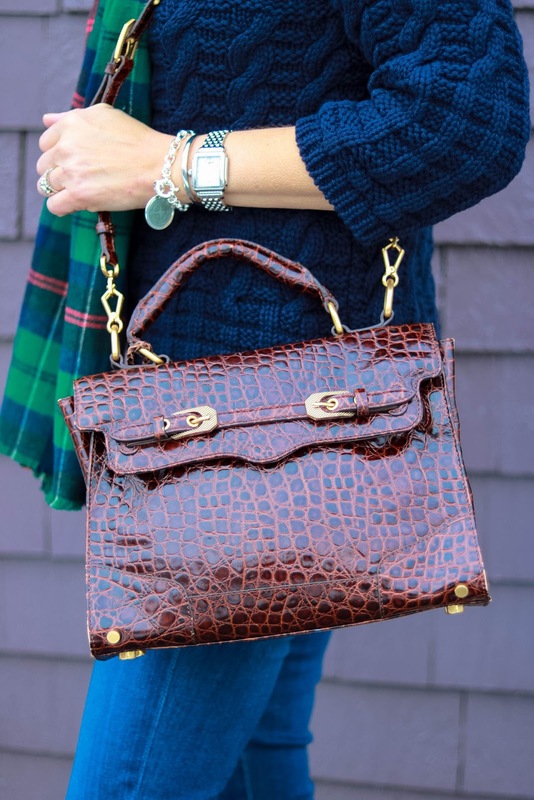 My Rebecca Minkoff faux croc bag was a consignment find from a trip to West Palm Beach years ago. Here is a similar style HERE. These super duper comfy boots are by Ecco--they're great for running around town. Because I love them so much, I bought them in black too. When I find a comfy shoe/boot, I want it in every color. Style and comfort is not easy to come by! Very similar Ecco boots HERE. 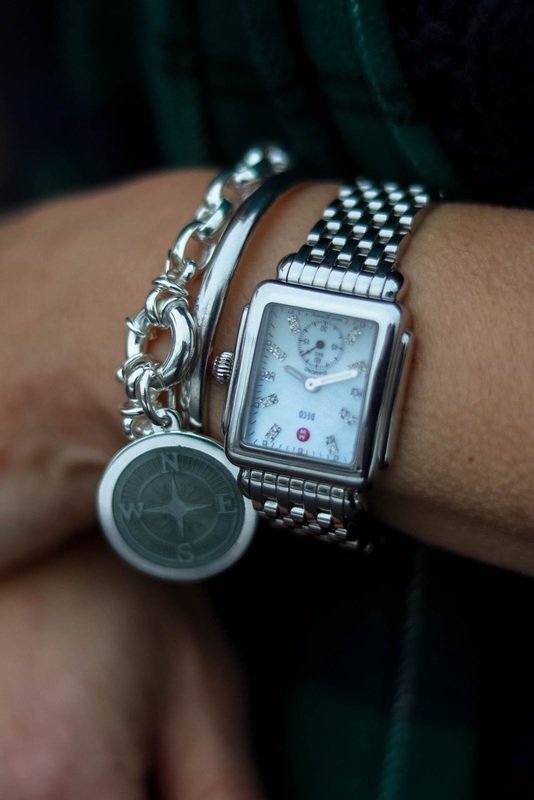 I wear my Michele watch all the time and love to stack a bracelet or two with it. This Lola bracelet pairs just beautifully. Also from Helen Thomas. Simple silver bangle HERE. 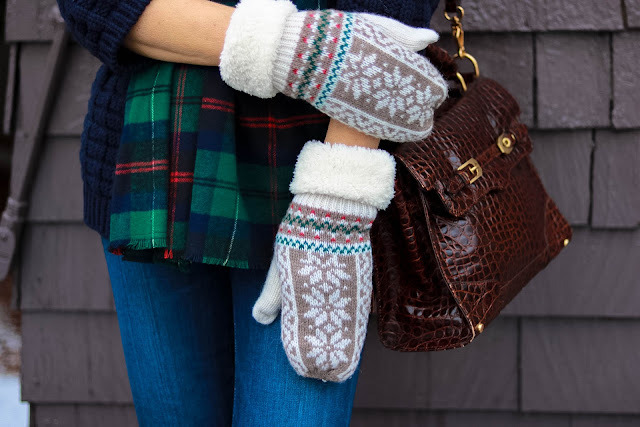 These mittens from Orange Scarf are just the coziest ever. I have Reynaud's Disease (super cold hands), and have no issues when these babies are on! Find Orange Scarf's glove and mitten collection HERE (SO reasonably priced!). Toasty hands, cozy sweater, warm scarf...check. Thanks for stopping by---stay warm! Some links in this blog may generate a small commission and the Orange Scarf mittens were gifted. However, the content of my posts are based on my own honest opinions and are not in any way influenced by partnerships. Just love the colors in that scarf! What about the jeans? They are adorable! Great casual and cozy outfit. I love the texture in the sweater. 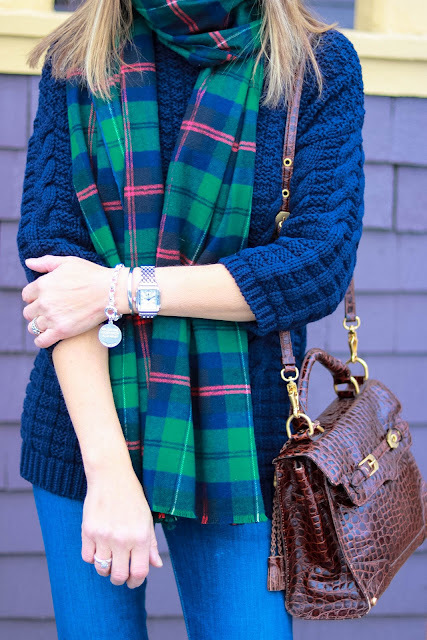 Cozy, comfy, classy, cute ... and chic! Love this! And oh how I would love a cup of Ultimate Perk right now!! Thanks so much for linking up! There's something immensely fresh and soothing about this palette, Susan, you look lovely. You look great! I love following your blog cause I used to live in Andover, now in sunny Florida where we all wear shorts and teeshirts 10 months of the year! I actually miss wearing cold weather clothes. When the temperature drops here to 80, all the girls start wearing their jeans and boots! I just love all of this, Susan! The colors of your scarf are my absolute fave! Anything green is basically my absolute fave. And green and blue are so good together. Your mittens are quite adorable, too. Thanks for linking up with me On the Edge. Great casual look, Susan. 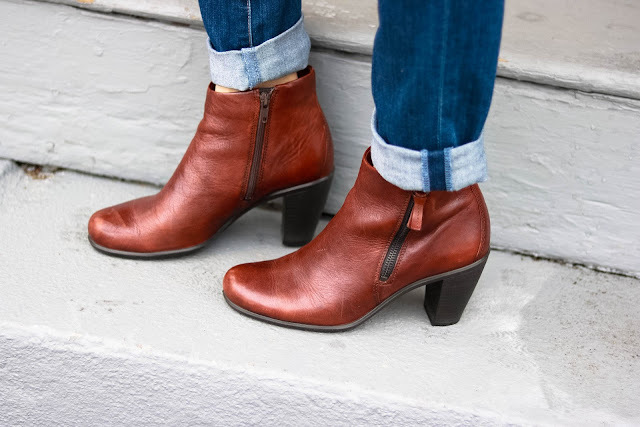 I am seriously dying over those booties! Also you just made me realize I have no green plaid scarves - there is something wrong with that picture. Thanks so much for linking up with Fabulous Friday!